When it comes to one of the best high-end polish lines on the market, Ji Baek's Rescue Beauty Lounge is a clear winner. My personal favorite - Concrete Jungle - glides onto the nail so lusciously, you only need one coat to acheive mani-perfection! 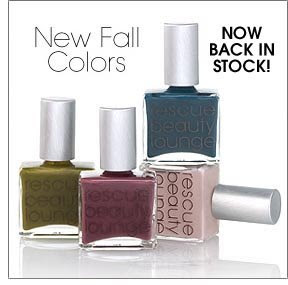 Well, my pets get ready for luxury this fall with the new fall color launch from Rescue. In an ode to our current political state, No More War, is a must wear on your way to the polls. If you can't make a statement any other way, your nails can do the talking for you with this creamy army green. Once you've casted your vote (goooo BARACK!!!!) switch up your look and slap on Teal to add instant spice to any outfit - this is a great color for those who aren't so comfortable with making loud fashion statements, but don't mind colorful hands. The Teal would look amazing on olive toned skin complexions and I cannot wait to try it. For all the 'Basic Betty's' out there, Ji didn't forget you and re-launched the neutral pink Plies. And in true fall fashion Bruised is the 'just right' purple, not too light and not too dark, to keep you on trend. Have fun with color this fall/winter and always remember that Beauty is to the Rescue :). P.S. Concrete Jungle (much darker than how it appears to the right) is not a part of the collection, but is a definite must have for fall. I encourage you to try it and get into the swing of things with this fantastic shade of grey. And did I mention, grey is one of the hottest colors for the season - so pick this up and don't get left out in the cold! "On the first day of Christmas my true love gave me a mani and a pediiiiii." 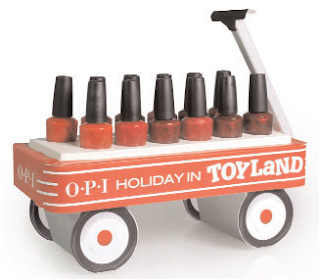 Yes my darlings I cannot believe it either, but the holiday seasons are here and our great friends at OPI have launched OPI in Toyland - a fun, cute collection featuring favorite red shades and hot to trot colors to get us all into the holiday spirit. From creams to shimmers there's a red, shimmery silver or gold for everyone. Whether you want to paint your nails for the heck of the holidays or get spiced up for New Years this is the go-to collection. With colors like A Ruby for Rudolph and Play til Midnight, the good times begin here! For those of you a wee-bit afraid of color, fret not. OPI created a neutral shaded collection with light golds, iridescent whites and basic darks just for you. You can Sheer Your Toys and play with You're Doll all night long. And their nails are undoubtedbly fabulous! My favorite brand, OPI, has launched a mini Halloween nail collection dubbed Get In-Spider-ed that features four fun shades for the Halloween seas on. The mini nail kit not only includes fun decorating tips, but super cute nail decals as well. The four colors are indicative of the typical goony goon palette of Red, White, Orange and Black - except the fun factor here is the white shade, The Ghostess with the Mostess, apparently glows in the dark. The other shades have been done before Spiderella = OPI INK, Heeeeere's Jack = Brights Power and Red-y to Strike = The Thrill of Braz il. If you definitely have to add to your collection, as I will without a doubt, I'd 100% go for The Ghostess with the Mostess - it's a must try! Check www.opi.com for information on Halloween nail decorating tips. Party Like a ROCK STAR~! 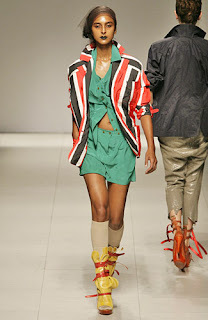 So a bit off topic, but well worth sharing are images from Vivienne Westwood's Spring 2009 London fashion show. Not only did models slink down the runway in avant guarde styled fashions, but the beauty palette was more like fall vs. spring. Dark stained lips and barely there make-up made the looks feel more vampire-ish than cherubic - but I loved it! Deconstructed knits, meticulously placed lace and sequence, and sicker than sick shoe options proved that you don't always have to go Alice in Wonderland for spring. Menspiration was ever-present in the collection. 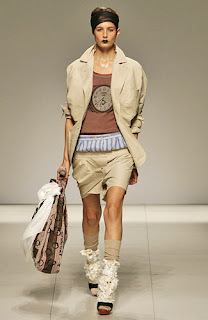 Models graced the runway in vests draped over dresses, printed and khaki colored boy cut shorts, oversized blazers and what appeared to be stripped boxers shorts peaking out of khaki shorts -Androgyny at it's best. The shoe game showed more of Westwood's point of view, feminine with a twist. Strapy heeled platforms some laced all the way up the leg, Jesus be Cool-esque sandals, muffin top closed heels with open toes and ruffle inspired heels provided an additional vision of fantasy and pleasure. 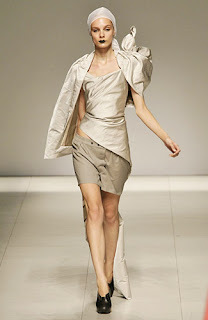 One of my favorite looks consisted of a multi-tiered skirt of grey and beige paired with a PVC sweetheart collared jacket, headband and killer lace-tied shoes. 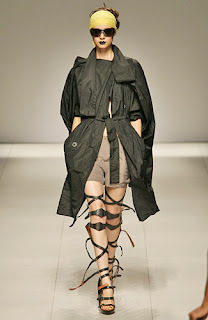 Another fantastic look paired a black trench (the main ode to spring in this collection) with lace up the leg platform sandals, khaki shorts and super chic shades. Can someone say incognito? If you want an edgy look, whether its rock n' roll or you just simply want to try something new, it just doesn't get any better than this!